With larger foliage than the species Ajuga reptans ‘Catlins Giant’ is the most widely grown form. Tall flower spikes in spring with attractive mauve flowers. This is a mat forming evergreen perennial that has been used as a low care ground cover plant for many years. Best planted in a position where it is naturally confined rather than allowed to spread in bushland. Also known as “Bugleweed’ it makes a great plant for underplanting taller shrubs in containers where it works as an evergreen ground cover plant..
Ajuga reptans ‘Catlins Giant’ with its coppery green leaves spreads quickly to form a thick mat, although it can be planted with strong growing spring flowering bulbs such as Daffodils, that will happily push their way up through the foliage. Frost tolerant once established and not needy in terms of soil requirements and with the ability to grow equally well in full sun to dappled shade. Ajuga reptans ‘Catlins Giant’ does like a well drained position. Landscaping uses include a ground cover position where you want little care and do not intend to grow much else. Mass planting beneath trees. Height – .5m when in flower, lower the rest of the year. Spread – Will spread to 1m over time, eventually further in ideal conditions. Easily controlled. Soil – Humus rich well drained is best, however will cope with poor soil. Growth rate – Medium in good soil, slow in poor soil. 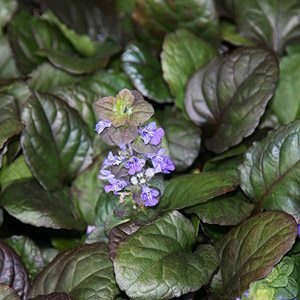 Foliage colour – Glossy Coppery, Blue / Green. Flowers – Pale Purple to Blue appearing in autumn. Fertiliser – All purpose slow release type in spring.